Hawaii: 1851-52 "HI and US Postage" 13 cents blue type 1, unused. 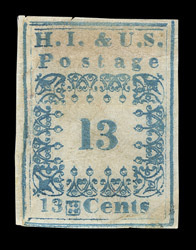 bl.uk > Online Gallery Home	> Online exhibitions	> Philatelic rarities	> Hawaii: 1851-52 "HI and US Postage" 13 cents blue type 1, unused. Before the annexation of Hawaii by the United States in 1898, the country had been independent and until 1893 a monarchy. American Missionaries had settled in the islands from 1820 and much of the mail was to and from the United States. A postal service was established in 1850; stamps were first issued in 1851 and printed at the Government Printing Office, Honolulu. At first these stamps only covered local postage (inscribed “Hawaiian Postage”) but from 1852 covered local and United States postage (inscribed "H.I. & U.S. Postage”). The “Missionary issue”, as these are known, are amongst the rarest stamps that exist, only seventeen of both of the 2 cents types and ten of one of the 5 cents types exists.